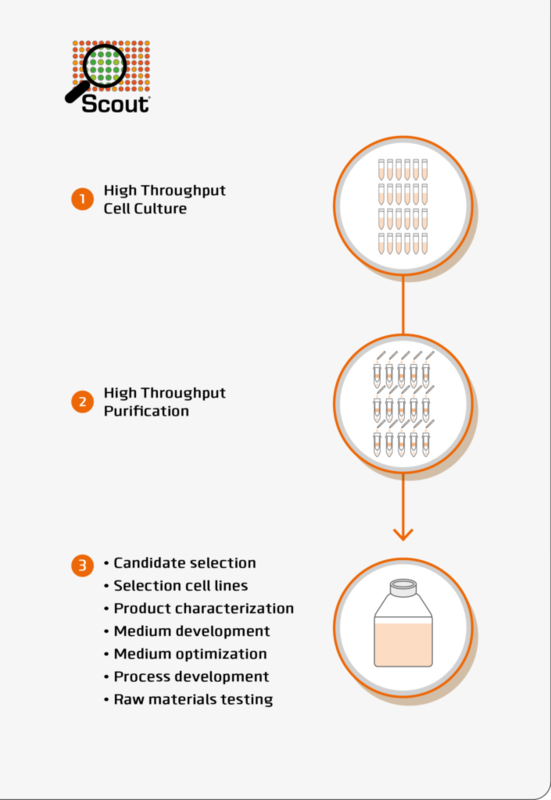 The SCOUT® platform integrates scaled down, high throughput cell culture systems with high throughput purification and analytical capabilities. In combination with a comprehensive Design of Experiments (DoE) approach, we can rapidly generate functional product data, accelerating candidate selection and driving efficient process optimization. Rapid product quality analysis for example allows clone selection not only based on yield but also on product quality attributes such as glycosylation, aggregation and potency. The SCOUT® technology is a system for optimizing upstream and downstream processes for all major classes of biopharmaceuticals be it proteins, antibodies, viral vaccines, or viral vectors for gene therapy protocols. In the upstream development, SCOUT® is frequently used for, but not limited to, yield and growth optimization projects and has proven its worth with documented increases in yield of at least 5-fold. The upstream process is typically performed at 2-20 mL scale and allows hundreds of cultures to be tested in parallel. Results obtained with SCOUT® has been successfully scaled up to 1000 L bioreactor volume hence demonstrating scalability of the obtained results. In downstream development SCOUT® is used to process high numbers of samples using scaled-down purification technology ranging from 50 μL (96 well plates) to 2 mL tubes (customized spin filters and spin traps). With this capability, your downstream development can already be initiated when upstream development is still in progress, providing only limited amounts of material. The high throughput SCOUT® technology is able to provide sufficient purified material to generate robust, representable analytical data, including glycan profiling, aggregation analysis, glycan analysis, and in vitro potency testing. The innovative SCOUT® platform is developed by Batavia Biosciences and has been proven to be successful for mammalian suspension cell lines (CHO, HEK293 and customer specific cell lines), mammalian adherent cell lines (MDCK and VERO) and microbial (E.coli) strains.